There was a time when places like Panago were inexpensive. Back when it was known as Panagopoulos, we could get 2-for-1 pizzas on the cheap. Remember Pizza 222? Same idea. However, it is increasingly clear that pizzas ordered from the big chains are no longer a cheap meal idea (assuming we're not looking at specials and/or coupons). Well, there is Little Ceaser's and their hot 'n ready pizzas at $5.00; but there is more cheese found in a bag of Cheetos, so it doesn't qualify as pizza. And let's not even get into Pizza Hut... With all the independent pizza joints around, we really do not have to rely on the pizza chains. Personally, I don't want to pay almost $20.00 for a pizza, unless if it is something special (like Steveston Pizza). So when a place like Hot Millions offers any size, any 5 toppings for $8.95, it helps keep the money in my wallet (until I spend it on other food). Now you'd think that for $8.95, they would start short-changing you on the toppings and the cheese much like Little Caesar's. Think again. Looking at the first slice of pizza, being the the Tandoori Chicken, there is no shortage of spiced chicke n, green peppers and cheese. 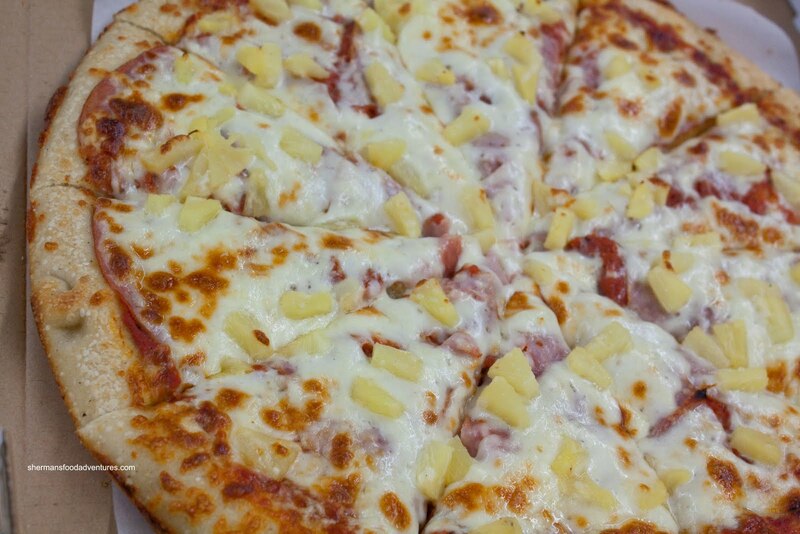 Considering its location, this is a pretty typical pizza. Hey, I love this personally since I love Indian food! 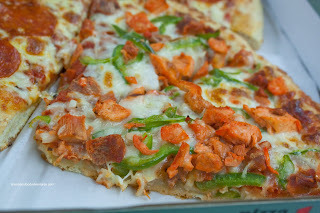 I've had butter chicken pizza at another nearby pizza joint as well. Something different from the usual. The crust is somewhere between a deep dish and something like Domino's regular crust. Nothing to write home about; but fine nonetheless. 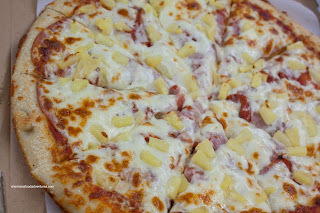 We also got a Hawaiian and since we basically had a choice of 5 toppings, we just got more ham and some salami as well. Made for a meaty pizza with once again plenty of cheese. 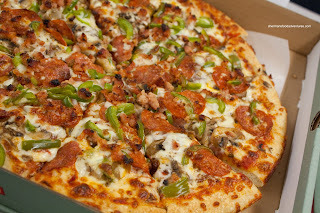 It is worth noting that the pizza wasn't particularly oily as well. Not sure if they used skim milk mozzarella or not; but it sure seemed like it. Lastly, we finally got all 5 toppings with the Deluxe and as you can clearly see, they are consistent with their generous amount of toppings. No other chain pizza joint can touch this considering the combination of price, amount of toppings, cheese and quality of pizza. 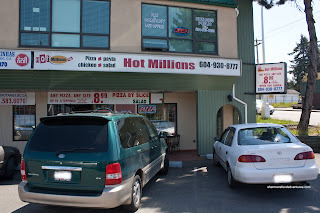 If you live nearby, Hot Millions is a good bet for an inexpensive meal.